The NECCDEP is purely a development oriented project. The goal of the project is to reduce poverty and meet basic needs in coastal communities in three districts (Trincomalee, Batticaloa and Amparai) of the eastern province. The project's purpose is sustainable livelihood improvement and sound management of natural resources, said Mr.Croos. 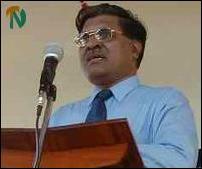 Mr.Croos earlier served as the Government Agent of the Mannar district and later held important positions in the NEPC and North East Community Restoration Development (NECORD) project. The total Project cost is estimated at $ 28.4 million to which the Government of Sri Lanka will contribute $ 5.6 million and the beneficiaries $ 1.3 million. The government of the Netherlands is providing a grant of $ 1.5 million to support capacity building in environmental protection and monitoring, he said. The project areas in the eastern province contains a population of about 550,000 people out of a total population of 1.5 million and the project beneficiaries include fishers, fisher-agriculturalists, small farmers, landless laborers, and small entrepreneurs. There will be a particular focus on women as the most disadvantaged among the target group. Thirty-eight percent of the population in coastal Grama Niladhari (village level administrative) divisions are Tamil, 59 percent are Muslims and 3 percent are Sinhalese, sources said. The project area is delineated based on the recognition of the linkages between and physical proximity of coastal communities and the natural resource based upon which they depend on their livelihoods, and accordingly comprises the 396 Grama Niladhari divisions in the eastern province on the open coast and around major lagoons. The project would include identified areas in the northern province after the completion of the feasibility study, which is to be undertaken next year, sources said. According to the project paper, Trincomalee Bay, Batticaloa Lagoon, and the southern Amparai biodiversity zone in the eastern province have been already selected for interventions to improve natural resource management and address acute environmental problems under the three Special Management Areas (SMA). The Trincomalee Bay is a large natural harbor and has significant potential for economic development. Currently within the SMA there are major areas of localized pollution sources, shoreline erosion, and coastal degradation hat are negatively affecting local livelihoods. The Batticaloa lagoon is a critical natural resource area and provides livelihoods for a very large proportion of the local population. It is also ecologically and environmentally significant, and is at risk from over-exploitation of its resource base and pollution sources entering the lagoon system.